Thread: TeeChart Stacked Bars - Why are negative bars tranparent? TeeChart Stacked Bars - Why are negative bars tranparent? OK racked my brains on this one. I've a chart with three bars in two StackGroups. 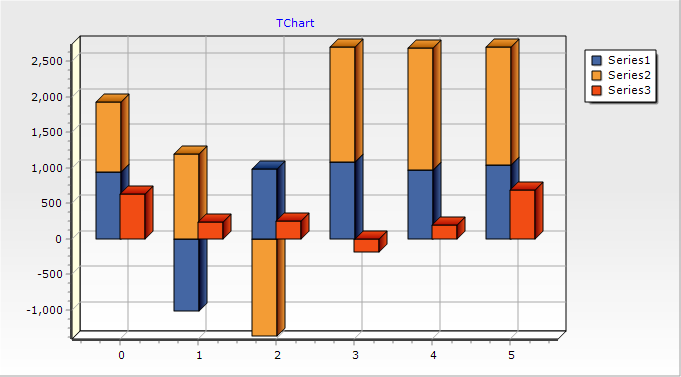 Two bars stacked beside the third on a 3D chart. Problem is that when one or more of the stacked bars has a negative value, it is painted in a translucent way. Doesn't matter what palette I use, which of the 3D layouts is chosen. The TeeChart version is the Vcl option that comes with RAD Studio. I've tested it with XE7 and Seattle, with identical results. Happens both in compiled code and development mode in the IDE. I've exported the Chart as EMF and opened it outside of the program and IDE, with the same issue. Re: TeeChart Stacked Bars - Why are negative bars tranparent? And I can't reproduce the problem reported with the latest TeeChart Pro v2017.22 and with TeeChart Standard v2015.15 shipped with RAD Studio 10 Seattle. Thanks Yeray for your prompt response. I've been on leave, so I've only just seen your test and results. The image from your simple test code is subtly different from my problem, in that the stacked series are on the left. My application has the stacked pair on the right. I'll play with this a bit and see if I can get more data. OK that didn't take long at all. and you get the result my application delivers. Positive values stacked are opaque, negative values stacked are translucent. Oh and, I am using TeeGDIplus, if that is a significant factor. Thanks for the code and for reporting it! Thanks Yeray. I'll monitor the public report. Just as a side issue, what is likely to be the outcome? Will I be able to get a "patch" for my RAD Studio environments? I'll monitor the public report. You can just add your mail to the CC list to be automatically notified when an update arrives to a ticket. Just as a side issue, what is likely to be the outcome? Will I be able to get a "patch" for my RAD Studio environments? Take a look at our Bug Fixing Policy. I've just fixed it for the next maintenance release.